I was watching an episode of Monk the other day, and he was on a case where detective Adrian Monk had to adopt a dog. His assistant Natalie bought him a Sha-poopie to clean up after the pooch. If you’ve ever watched the show, then you know how germ-phobic Monk is. I would imagine that for him to clean up dog leavings would be the ultimate torture. The Sha-Poopie is a device that allows the user to get under the dog’s…tail as they are…bowel moving, and catch the crap before it becomes against the law. 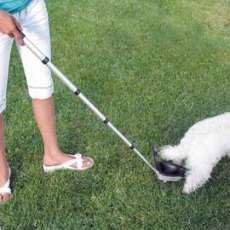 Inventor Dan Shalhoub was inspired by the fact that he owns a dog, and he hated bending over to pick up the mess. He has a bad back, and noticed that most products that clean up after the dog are rather “after the fact”. He invented the Sha-Poopie as “preemptive, catch it in the act product”. You may have also seen the Sha-Poopie on a television show called American Inventor that aired a few years ago. Dan Shalhoub did not win, but the judges noticed the odd resemblance between him and the aforementioned Adrian Monk (Tony Shalhoub). There is a good reason for that. Dan and Tony are brothers. So I guess what we saw on that one Monk episode was a subliminal plug for the Sha-Poopie. Cute, Shalhoub boys, really cute. You should be able to get the Sha-Poopie from the official site for about $24.95.